2nd half of Sept’18 to be less wet with fewer rain days than the first half of the month. Expect 4-6 days of thundery showers mostly in the late morning and early afternoon, and Sumatra squalls bringing widespread rain on 1 or 2 mornings. Singapore, 14 September 2018 – The prevailing Southwest Monsoon conditions are forecast to persist for the rest of September 2018. The low level winds over Singapore during this period are expected to blow from the southeast or southwest. 2 The second fortnight of September 2018 is forecast to experience less wet weather and fewer rain days compared to the first half of the month. During the fortnight, thundery showers due to strong solar heating of land areas, are expected mostly in the late morning and early afternoon on four to six days. The showers could extend into the late afternoon on a few of these days. In addition, on one or two mornings, the passage of Sumatra squall could bring widespread thundery showers accompanied by gusty winds over Singapore as the squall moves east toward the South China Sea. Overall, the rainfall for September 2018 is expected to be near-normal. 3 The daily temperature range on most days of the fortnight is likely to be between 25°C and 33°C. On a few days when there is with little or no rainfall, warmer conditions with maximum temperatures of around 34°C can be expected. 4 For updates of the daily weather forecast, please visit our MSS website (www.weather.gov.sg), NEA website (www.nea.gov.sg), or download the myENV app, or the MSS’ Weather@SG app. 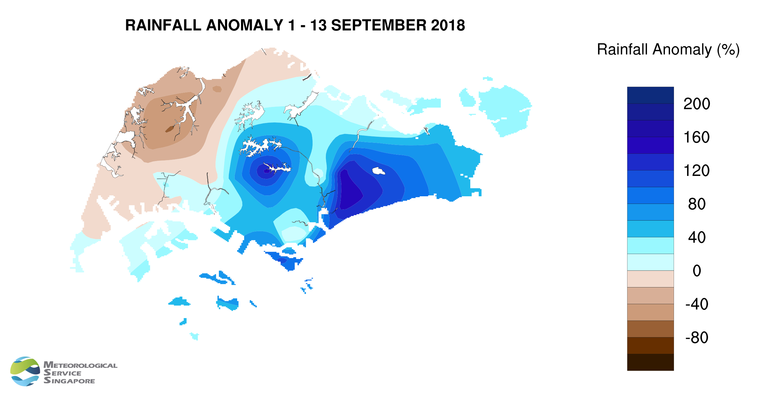 5 Southwest Monsoon conditions persisted over Singapore and the region in the first half of September 2018. During the fortnight, the low level winds over Singapore were blowing mainly from the southeast or south. 6 On most days in the first half of September 2018, the thundery showers fell over the island between the morning and early afternoon. The wet weather on these days were due to convergence of winds in the surrounding vicinity or to the eastward passage of Sumatra squalls from the Strait of Malacca to the South China Sea. In particular, the heavy rainfall over many parts of the island on 7 September, was due to a large-scale convergence of winds in the region. The daily total rainfall of 121.6mm recorded at the Upper Thomson area that day was the highest total rainfall in a day for the first fortnight of September 2018. 7 With wet weather conditions experienced on most days during the fortnight, the first half September 2018 was generally less warm compared to the last fortnight of August 2018. The daily maximum temperature in the first half of September 2018 ranged between 30.1°C and 33.7°C, and the daily minimum temperature was between 21.4°C or 26.4°C. On 4 September, Singapore experienced a pleasant maximum temperature of only 28.7°C following the widespread rainfall in the morning as a result of the passage of a Sumatra squall over Singapore and the surrounding region. 8 Above-average rainfall was recorded over three quarters of the island in the first half of September 2018. The lowest rainfall of 32.4 mm (64% below average) was recorded at Choa Chu Kang West. Rainfall was highest at Katong where 182.0 mm (161% above average) was recorded.